NEW YORK (Reuters) – Wall Street’s major indexes all slid more than 2 percent on Monday, with the benchmark closing at its lowest in 14 months, on concerns about slowing economic growth ahead of a highly anticipated decision from the Federal Reserve this week on the course of U.S. interest-rate hikes. The S&P 500 hit its lowest since October 2017 to breach lows reached during its sell-off in February, having wiped out about $3.4 trillion of market value since late September. The small-cap index confirmed a bear market, having fallen more than 20 percent from its Aug. 31 closing high. A profit warning from British retailer ASOS (LON:) raised concerns about weakening consumer strength, despite robust U.S. retail sales data on Friday. The National Association of Home Builders Housing Market Index indicated homebuilder sentiment had fallen to a three-and-a-half-year low. The S&P 500 briefly erased its losses in late-morning trade, but the index resumed its steep decline after Jeffrey Gundlach, chief executive of DoubleLine Capital, said that U.S. stocks were in a bear market. Concerns about flagging consumer sentiment pushed down S&P 500 consumer discretionary stocks, which tumbled 2.8 percent. Shares of Amazon.com Inc (NASDAQ:) dropped 4.5 percent, creating the biggest drag on the S&P 500 and the Nasdaq. Retail stocks declined overall, with the S&P 500 Retailing Index falling 3.4 percent. An indication that the Fed would slow its pace of interest-rate hikes could calm markets, but the U.S. central bank’s intentions remain unclear, said Ryan Detrick, senior market strategist at LPL Financial in Charlotte, North Carolina. 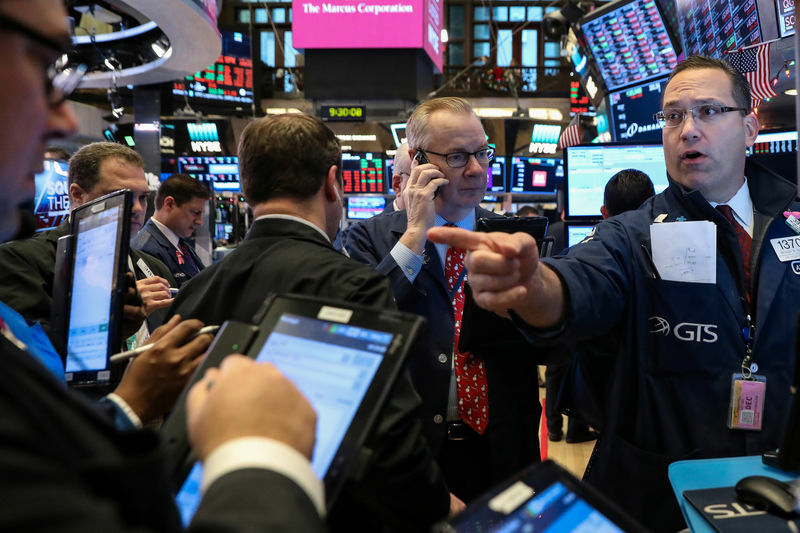 The fell 507.53 points, or 2.11 percent, to 23,592.98, the S&P 500 lost 54.01 points, or 2.08 percent, to 2,545.94 and the dropped 156.93 points, or 2.27 percent, to 6,753.73. Shares of insurer UnitedHealth Group Inc (NYSE:) fell 2.6 percent after a federal judge late on Friday ruled that the Affordable Care Act, commonly known as Obamacare, was unconstitutional. UnitedHealth was the biggest drag on the Dow. Johnson & Johnson (NYSE:) shares fell for a second consecutive session following a Reuters report that the company knew for decades that its baby powder contained asbestos. J&J shares ended 2.9 percent lower. Shares of Goldman Sachs Group Inc (NYSE:) dropped 2.8 percent to a two-year low after Malaysia filed criminal charges against the bank in connection with an investigation into suspected corruption and money laundering involving the sovereign wealth fund 1MDB. The stock has the biggest year-to-date percentage decline among Dow components. Twitter Inc (NYSE:) shares slid 6.8 percent after the social media company warned of suspicious traffic from China and Saudi Arabia and disclosed an issue that could have revealed the country code of its users’ phone numbers. Volume on U.S. exchanges was 9.44 billion shares, compared to the 8.01 billion average over the last 20 trading days.